Looking for a charm pack with a random mix of primitive country colors? This Primitive Homespun set will surely please. These soft, dusky colors make beautiful quilts and crafts. The fabric in these 6 inch charm packs is 100% cotton homespun fabric. The precut squares have been steam pressed and professionally cut. A few extra bonus squares are always included in every pack. You will receive 2-8 squares of each of the designs shown here making a total of 40+ squares. Occasional fabric substitutions may occur based on fabric inventory availablity. This homespun fabric is perfect for making ragged style quilts and crafts. It is guaranteed to fray well, unlike most regular cotton fabrics. 100% cotton | Assembled in USA +/- 1/4" variation in size is possible. 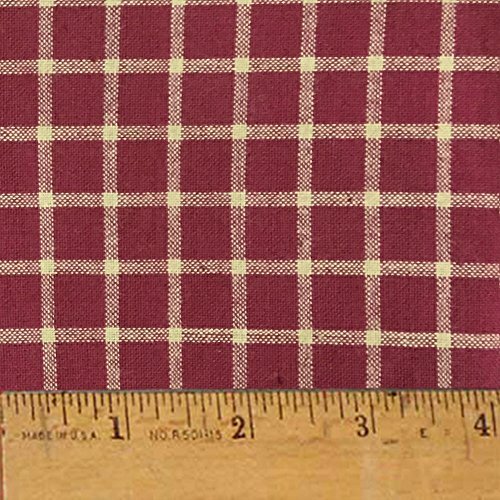 Rustic Red 2 - This soft 100% cotton yarn dyed homespun fabric is 44-45 inches wide and is the perfect fabric to use for the popular ragged style quilting. 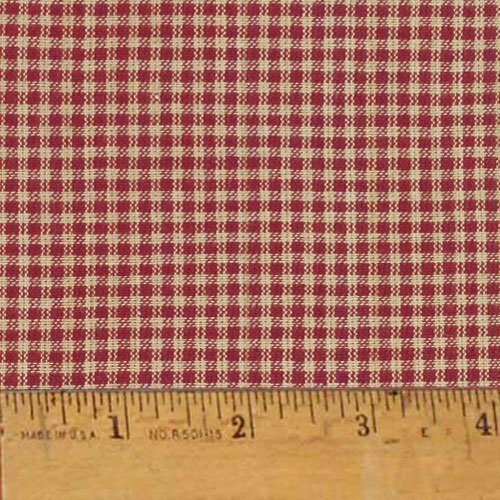 The colors of this fabric are a rustic country red with a soft tea dye neutral. It coordinates well with all our other JCS Rustic Red fabrics and kits. Sold by the yard. Multiple yards will be shipped in one continuous length up to 15 yards. Over 15 yards will be multiple pieces. 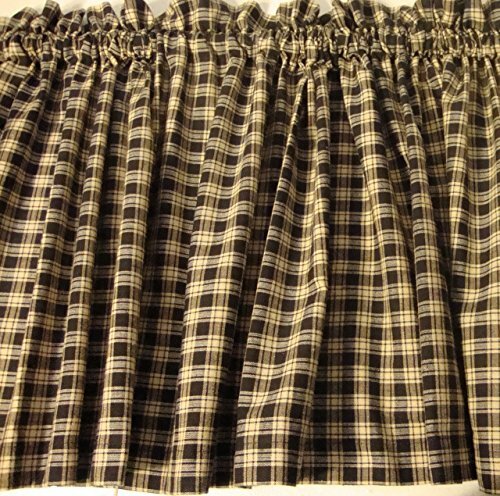 Black and tan homespun cotton window valance measures 72" wide x 14" long. The length includes a 1.5" header and a 1.5" rod pocket. The valance is made from lightweight cotton fabric. The valance may be hung on a curtain rod or with clips. If you are gathering the valance, you will need twice the width of your window for adequate coverage. Please order all you need at once so I can match the pattern and the dye lot across all valances. Lining is an option for all valances. If you prefer the valance to made without a header or with a wider rod pocket, just let me know. I can also make make matching tiers if you need. I will be glad to help with any questions you may have. All items are made in my smoke-free home studio. 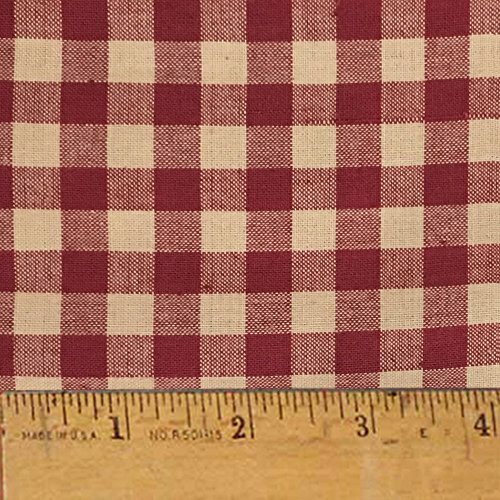 Rustic Red 5 - This soft 100% cotton yarn dyed homespun fabric is 44-45 inches wide and is the perfect fabric to use for the popular ragged style quilting. The colors of this fabric are a rustic country red with a soft tea dye neutral. It coordinates well with all our other JCS Rustic Red fabrics and kits. Sold by the yard. Multiple yards will be shipped in one continuous length up to 15 yards. Over 15 yards will be multiple pieces. 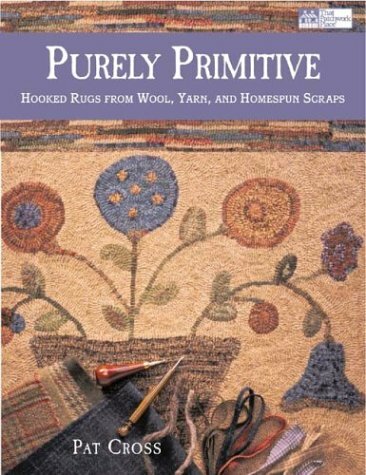 Re-create the look of old-fashioned rugs with today's techniques! It's easy with this start-to-finish guide, plus 11 fun step-by-step projects. 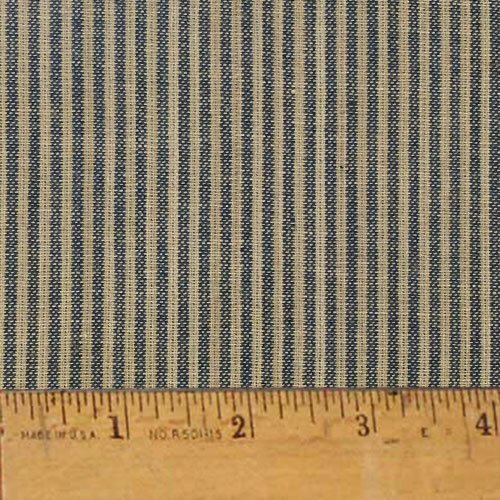 Heritage Blue Stripe - This soft 100% cotton yarn dyed homespun fabric is 44 inches wide and is the perfect fabric to use for the popular ragged style quilting. The colors of this fabric are soft dark blue a dark off white neutral. 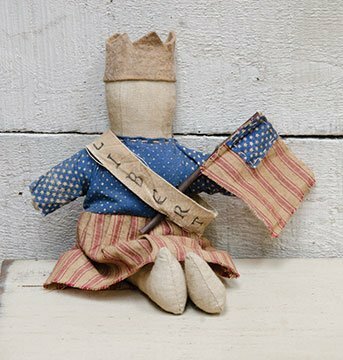 It coordinates well with all our other JCS Americana and Primitive fabrics and kits. Sold by the yard. Multiple yards will be shipped in one continuous length up to 15 yards. Over 15 yards will be multiple pieces. Rustic Red 7 - This soft 100% cotton yarn dyed homespun fabric is 44-45 inches wide and is the perfect fabric to use for the popular ragged style quilting. The colors of this fabric are a rustic country red with a soft tea dye neutral. It coordinates well with all our other JCS Rustic Red fabrics and kits. Sold by the yard. Multiple yards will be shipped in one continuous length up to 15 yards. Over 15 yards will be multiple pieces. 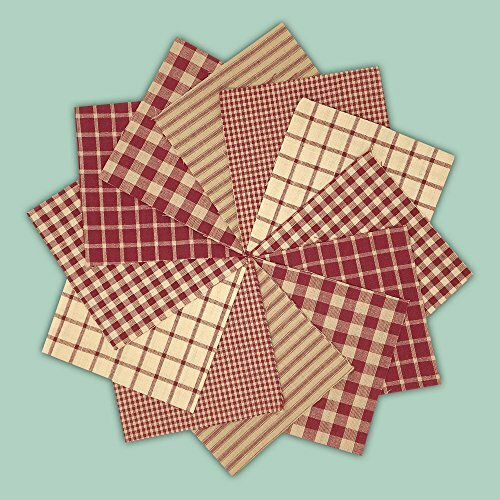 The warm cozy red plaids of this primitive homespun fabric charm pack bring an earthy richness to any rag quilt project. These rustic colors of red and tea dye are great by themselves or combined with other homespun plaids. The fabric in these 5 inch charm packs is 100% cotton homespun fabric. The precut squares have been steam pressed and professionally cut. A few extra bonus squares are always included in every pack. 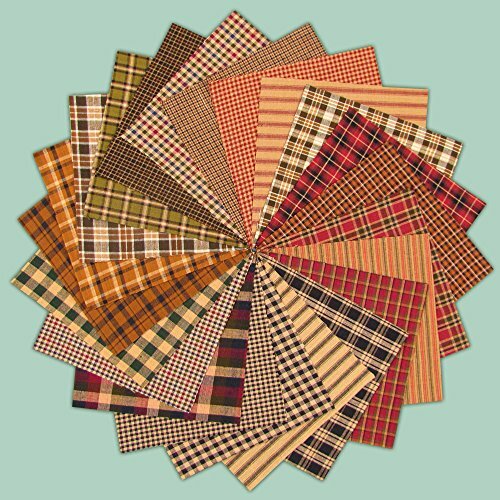 You will receive 4-10 squares of each of the five different fabric designs shown here making a total of 40+ squares. Occasional fabric substitutions may occur based on fabric inventory availability. 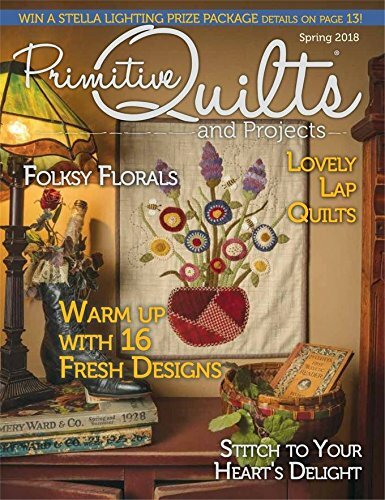 This homespun fabric is perfect for making ragged style quilts and crafts. It is guaranteed to fray well, unlike most regular cotton fabrics. 100% cotton +/- 1/4" variation in size is possible. Copyright © Wholesalion.com 2019 - The Best Prices On Primitive Homespun Online.